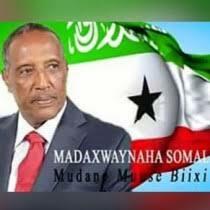 - A high level Somaliland Delegation led by the minister of foreign affairs and international relations Dr. Mohamed Abdillahi Omar has today met separately with the U.A.E minister of State for Foreign affairs Dr. Anwar Mohamed Gargash and Assistant Foreign *Minister* for Security and Military Affairs Faris Al-Mazroui. The Somaliland delegation which consisted of three cabinet ministers namely Dr. Mohamed Abdillahi Omar minister for foreign affairs, Hon Hirsi Ali Haji Hassan the minister of Presidency, Minister of Water, Energy and Water Hon Hussein Abdi Duale and the director general of Berbera port Eng. Ali Omar Mohamed (Ali Hor Hor) discussed ways to strengthen the existing cordial relations between the two countries. The representatives of both countries discussed ways of strengthening of trade and military cooperation including the issue of expansion and upgrading of the facilities at the Berbera port by the Dubai Ports Authority a subsidiary of the Dubai world. Somaliland Official assured their UAE counterparts that Somaliland is open for business and that any UAE national official who wants to invest in the country is welcomed to do so. The UAE and Somaliland have developed close cooperation in the areas of trade, investment, the fight against piracy and regional affairs.